More children ride to school on an IC Bus than on any other bus brand in the world. 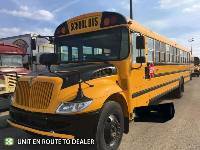 Maxim Truck & Trailer offers a complete line of school and commercial buses from IC Bus to fit your organization's needs. What sets IC Bus apart is that they build the whole bus – front to back, top to bottom. They design and build their buses with reliable, high quality products that allow their buses to travel longer and without roadblocks. By integrating every phase of production, distribution, and service, IC Bus delivers a better, stronger bus, at the best possible value. IC bus is a leader in its industry, focused on excellence now and for future generations. IC drives its future, always looking forward at the road ahead. With programs like No Student Left Behind, and features like full power hydraulic breaks, BTI seating, and steering wheel switches to keep drivers' hands on the wheel and their eyes on the road, IC Bus delivers on its goal to make the CE series the safest, most reliable vehicle on the road. Getting kids safely from pick-up to their destination is a base requirement for IC Buses. Reliability is key, so IC Bus has invested in a state-of-the-art engineering plant, employs integration leaderships, and is the only school bus manufacturer to apply a final layer of under-coating after assembly as standard, providing the under body components with an extra layer of protection. OnCommand Connection remote diagnostics system monitors your fleet to provide real-time comprehensive fleet management, enable quicker repairs, control maintenance and repair costs, and prevent breakdowns. The Diamond Logic Electrical System is best-in-class and allows for easy access of installing incremental features. Combined with Over-The-Air Programming, IC Buses are technologically ahead of the curve.